Before getting to the heart of the matter here are a few disclaimers. My expertise in the field of water chemistry is limited to observing the results of, and in some cases repairing, the damage caused by the introduction of improperly treated water into a boiler. My expertise does not cover water chemistry itself. Therefore, this article complies and presents information from sources who have experience and expertise in the field of boiler water chemistry. Any type of boiler made by any manufacturer will be damaged by the addition of water with improper chemistry. In most cases, damage caused by improperly treated entering a boiler is gradual and cumulative. This slow damage impacts a plant’s bottom line in the form of escalating fuel and steam system maintenance costs. Check the accompanying chart to see just how expensive a thin coating of scale inside a boiler can be. Coleridge’s quote pertains to this article because its focus is about unusable water. More specifically, water unusable in its current form. In the mariner’s case he was adrift, surrounded by water yet dying of thirst. He couldn’t just drink the water. He knew the dissolved salt in the water would kill him. For boilers, impurities in improperly treated water will, over a period of time, do the same. I’ve presented seminars on boilers and other machinery maintenance issues and invariably there is someone in the audience who claims they do not treat makeup water and have had no boiler problems. In some cases it’s true; the reason is, fortunately the quality of the city water where they are located allows for non-treatment. However, this is a rare occurrence; water quality varies significantly even in close geographical areas so beware, even if the cleaner on the next block gets away with it doesn’t mean you can. Water is often referred to as the universal solvent and therein lies the problem. Water dissolves almost anything it contacts – emphasis on almost.Salt, sugar, acid, bases, many gasses, water doesn’t care, it just dissolves and dissolves and keeps on rolling. Take a moment to think about that. What barbarian among us would confuse a glass of sparkling San Pellegrino or Perrier with a glass of common tap water, after all it’s just H2O isn’t it? The difference in taste is what’s dissolved in the water. New water added to a boiler condensate return tank must be treated to remove or control the concentration levels of many of these solutes (a solute is something dissolved in a solvent like water). 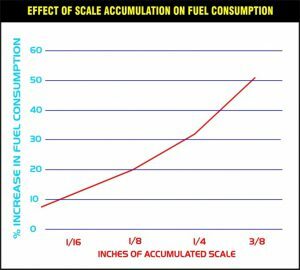 Look at the accompanying chart to understand the large effect a scale coating on boiler internals has on the increase in fuel consumption. TAP, MAKEUP OR CITY WATER-Raw water used to make up for the water lost in using the steam generated by the boiler. This water contains most of the impurities which require treatment. FEED WATER-Water contained in the return tank. A combination of fresh makeup water added to the tank and condensate returning to the return or condensate tank from the machinery. BOILER WATER- Water contained inside the boiler, which will be converted to steam. We will only be concerned with feed and boiler water from this point forward. 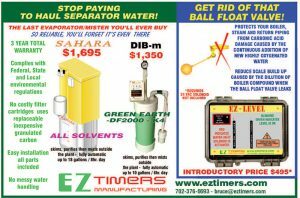 There are maximum allowable quantities of dissolved impurities for both feed and boiler water and these will vary slightly with each boiler manufacturer. This is a good place to break for this article, in the next issue we will delve into what’s dissolved in the water and how to treat raw water to make it safe to use in a boiler.